Party game to play with anyone by placing fingers. 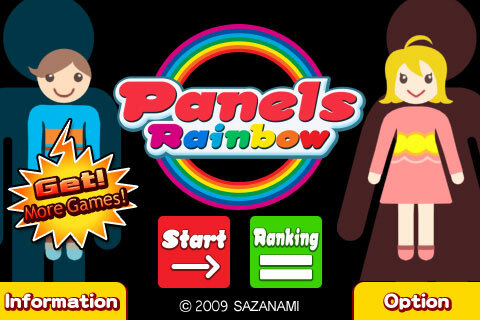 "Panels Rainbow" is an iPhone app arranged version of the twister game. Cooperate and get close with your partner. How you play this game depends on you. - Can play and communicate with your friends and families. - Cute characters designed suitable for all ages. 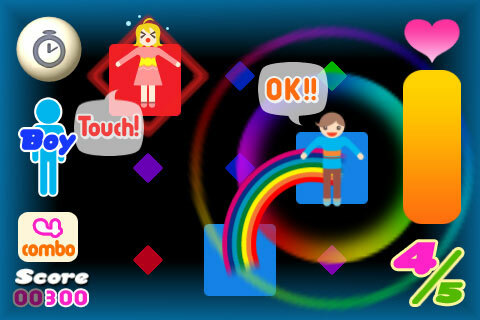 - Easy controls with simply touch on the iPhone screen. Move the characters "Boy" and "Girl" before they fall off the panel. As the Panels that the characters got on to disappear as the time passes, let the characters get onto the next panel before then. 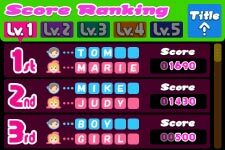 Move the characters specified amount of times to finish the level. You earn more scores by playing better with fewer misses. The life gauge decreases when you fail to move the character. This happens when you let off the finger from the iPhone screen. The game is over when the life gauge is all gone. Touch the character panels with your fingers. The panels shake and the life gauge decreases when you let off your fingers. - Create the rainbow bridge! �gBoy�h is on the blue panel, and �gGirl�h is on the red panel. Touch the same color panels when they appear with your other finger. The rainbow bridge appears across the two panels, and the character slides across to the next panel. - Be careful not to make mistakes! You can place the rainbow bridge only when the panels are blinking white. If you touch the panel too early or touch the other color panel, the life gauge decreases. - Single player game is also possible. Although this is a two player based game, it is also possible to practice before you cooperate with your friends. - Be careful with your fingernails. It is strongly recommended to keep your fingernails short and clean, so that you won�ft hurt your partner's fingers. - Modified the application icon.